Quality assurance can be defined as systematic and planned activities that are primarily implemented within a quality system to ensure that the requirements for quality when it comes to creating products and providing services are fulfilled. It also refers to system measurement, process monitoring, standard comparison and feedback loop that are capable of preventing errors. This works in contrast to quality control because the main focus of this process is process output. Quality assurance is also defined by a lot of experts as an effective approach centered on processes that ensure that an organization offers the best products and services possible to their consumers. Its focus is to improve process in order to create the best end results. It should also be noted that quality assurance is divided into vital parts including design, development, service, production and planning. Most of the time, the quality assurance follows the PDCA cycle. The first part of this cycle is Plan which requires organization to establish objectives and figure out the changes that they need to make in the processes to get the most desirable results. The second one is Do which involves the development and testing of changes and processes. The third part of the cycle is Check which involves the monitoring and evaluation of changes and processes to determine if potential results meet predetermined objectives. Act, which is the last step of the cycle, works by ensuring that the organization fully implements the desired improvements into business processes. The quality assurance certification course which you can now easily access at a highly reputable online certification company called Brainmeasures is the best course for you if you want to become a quality assurance expert. The quality assurance course offered by this company works by providing you with the most accurate information about quality assurance so it will never be impossible for you to come out as a real expert in this field after you successfully complete it. 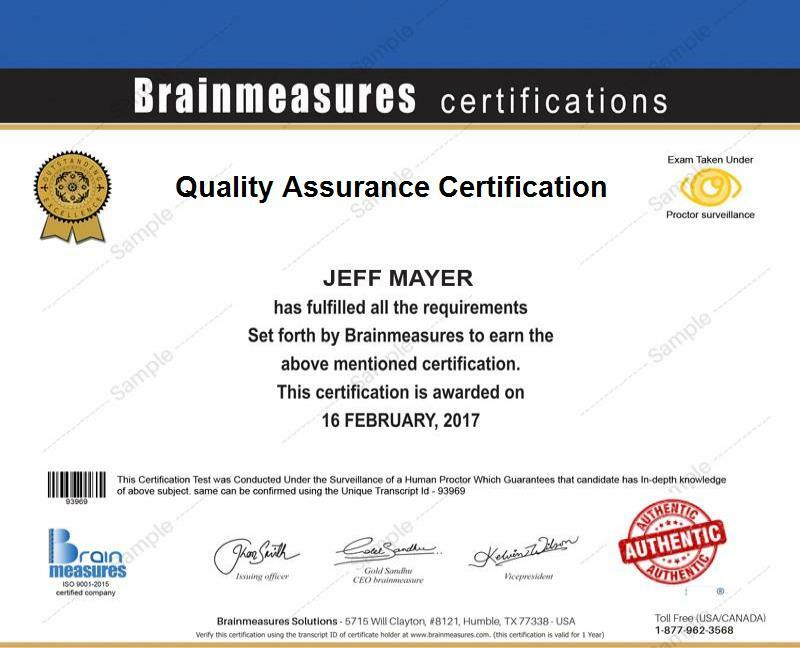 By taking part in this online certification program offered by Brainmeasures, you will have an easier time accessing a quality assurance training which explains in full detail everything about the subject including its most vital concepts, principles, the guidelines that you need to follow when implementing the quality assurance process, its most popular cycle and the many quality assurance tools that you can use in successfully implementing it. Completing this online certification course gives you the opportunity to receive your quality assurance certificate which is a major help in improving your skills and your confidence in correctly performing the process. How to evaluate product and process quality? How to effectively train for quality management? The quality assurance process is extremely useful in various business organizations so expect the quality assurance certification program offered by Brainmeasures to offer numerous benefits to hundreds of professionals. You can expect this certification course to work suitably for aspiring and existing quality assurance managers, representatives, department heads, production heads, quality assurance officers and anyone who wishes to take full advantage of the quality assurance process in creating the best products and services. If you want to significantly increase your income, then the quality assurance certification course can definitely help you out. You can take full advantage of your quality assurance certification by using it to work as a quality assurance manager which allows you to earn around $45,000 to $82,000. Your certification is also useful in easily filling the position of a software quality assurance engineer which offers around $68,000 to $96,000 annually.